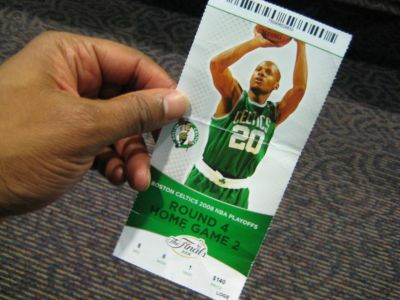 Last November I took a trip to Boston with my wife to see my Celtics home opener. 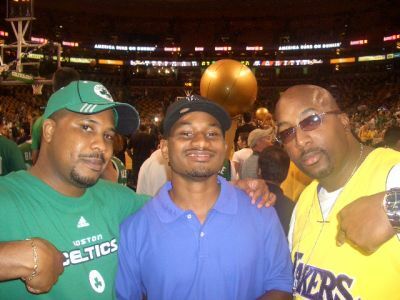 It was the first official game that Kevin Garnett, Paul Pierce and Ray Allen played together and they spanked the Washington Wizards in that game. 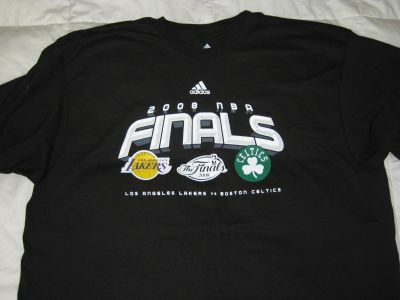 After that night I had visions of my squad making an appearance in the NBA Finals. 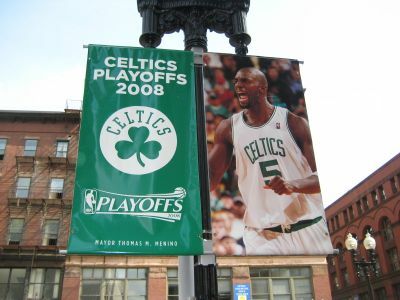 After a regular season which the Celtics won 66 games, I definitely anticipated the possibility. 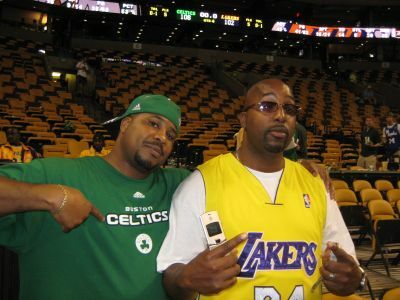 My man Juice and I had talked trash since last summer when we both debated on whether KG would get traded to the Celtics or the Lakers. 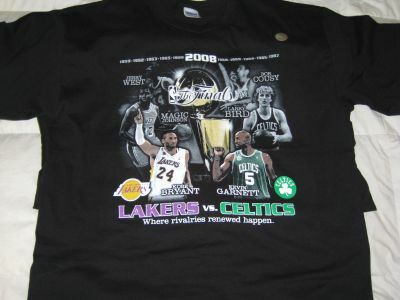 Well, we all know who won that sweepstakes. However we made a pact around the time of the NBA All Star break that if our squads made the NBA Finals versus one another, that we'd find a way to go. We made good on that promise. 5:45am - Awoke to the sound of the alarm of both my cell phones going off and the phone ringing. I obviously was making sure that I got up and using 3 methods including Verizon's reminder definitely did the trick. 6:15am - Left the crib with my backpack for BWI airport. 6:55am - After almost hitting a deer while driving on the parkway, I arrived at BWI airport. 7:24am - Got through security, took seat in front of gate A11 and wondered if there would be any other Black folks on the flight cuz I saw none in the seating area. 8:03am - 9:07am - Flight departed. 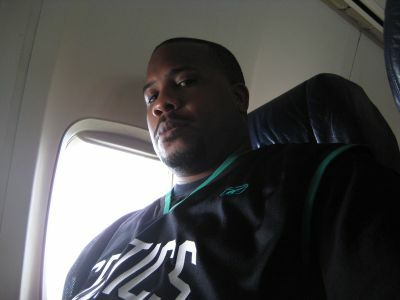 Some guy talked me to death on the plane cuz I was wearing my Paul Pierce #34 jersey. I ate my home packed powered donuts in a Ziploc bag and a fruit leather and drifted off to sleep. I was awakened to dude running his mouth again. The plane arrived at Providence with a hard landing that gave me an instant headache. 9:16am - Got to the Budget Car Rental counter. Had to stand in the line forever due to the fact that the fools in front of me want to argue with the only agent that is there. Finally given keys to my car... a bright red Ford Fusion. 9:20am - 10:36am - Drove the 48 miles to Boston. Got lost for a minute in the city. 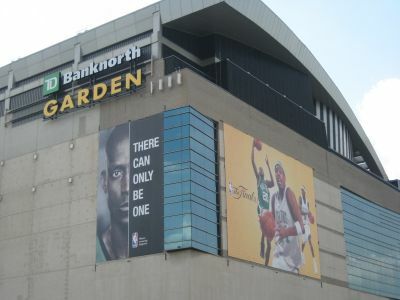 Saw the big mural on side of TD Banknorth Garden and drives in that direction. Headed across the bridge to the Residence Inn. 10:52am - 1:41pm - Found a parking space on the street. Got out of the car and it felt like a sauna. Hollered at my ticket hustle partner who's set up shop in his hotel room. I sat and watched the ending of the French Open and then Reno 911 on Comedy Central while he wheels and deals on the phone. I snacked on remnants of snacks that he swiped from the breakfast buffet. He offers me a Coors Light from the fridge, I declined. I got a text from my man Juice saying his flight from Orlando is in. 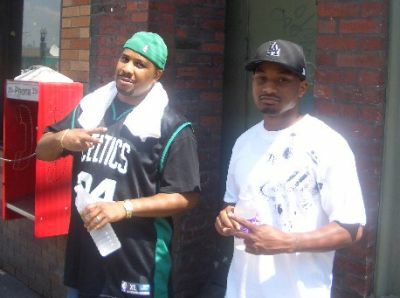 Me and my hustle man Big G headed for the Bulfinch Hotel. 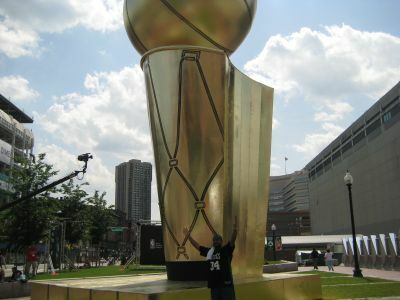 1:46pm - Passed by TD Banknorth Garden again and captured some images from the NBA Finals display outside. 1:58pm - 3:11pm - Hit up the hotel. Dapped up my man Juice and my other man Sly who's chillin' in the room. 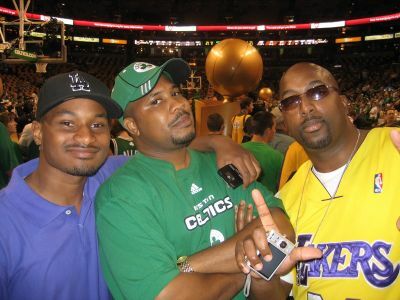 They're both Laker fans so we talked trash for a minute. Well, the trash talkin' really last all day. After a while went outside into the hot oven and walked the streets. Grabbed some bottled water from the 7-Eleven on the corner to stay hydrated. We ignored the cats on the streets begging for money. 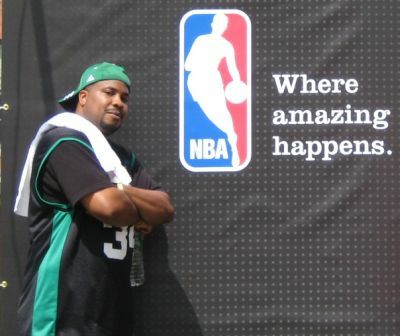 Hit up the NBA display outside of TD Banknorth Garden and took a rack of pics. 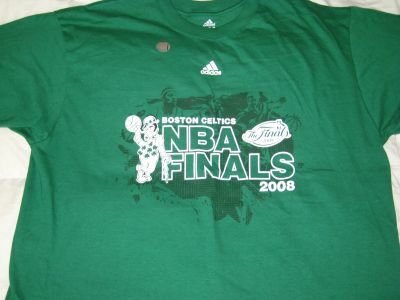 3:12pm - 3:23pm - Rolled to the Celtics store inside the arena. 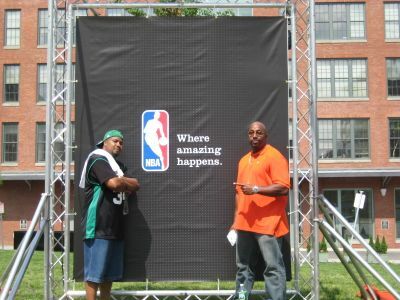 Those two jokers saw no Laker gear and stood outside. I promised to get a T-shirt for my Pops and I did that. 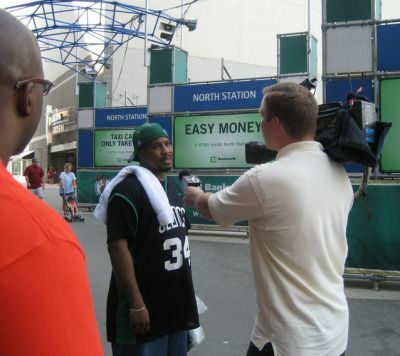 3:24pm - 3:29pm - While leaving the Celtics store I spotted a reporter from ABC6 in Boston. 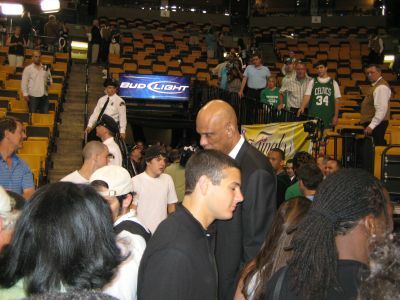 He saw me in the Pierce jersey, walked over to me and asked if I'd like to answer a few questions. 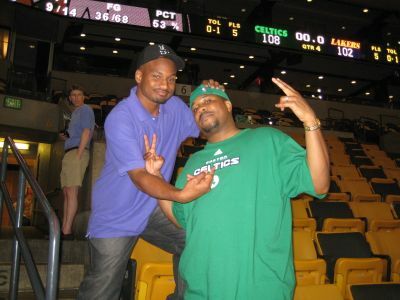 He asked me some stuff about Paul Pierce, his playing status for Game Two, whether I was attending the game and where I was from. He then interviewed Juice who did nothing but pop nonsense about Kobe this and Kobe that. 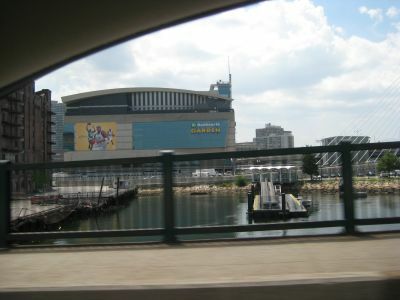 3:37pm - 4:06pm - We headed toward Government Center where the NBA Nation festivities were going on. They had some cool ESPN displays and intractive stuff. 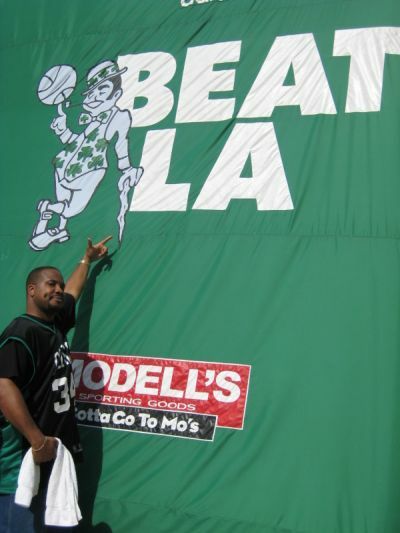 I saw a Modell's tent and copped more Celtics and NBA Finals T-shirts and a hat for souvenirs. Then I took a pic in front of this huge Beat LA T-shirt. I should've taken a pic of a glass of ice water and had it in my phone. I was sweating like Marion Barry out there in the 95 degree heat. You see the towel don't cha? 4:21pm - 6:42pm - Walked around Quincy Market. All of us were starving so we decided to hit up McCormick & Schmick's to grab some grub. I dined on steak and coconut shrimp knowing full well I'm allergic to shellfish and didn't have any Benadryl on me. I was only like 8 pieces of shrimp though. I survived.... lol. More trash talking ensued as Juice decided to get the waitress involved in the mix. She wasn't even a Boston native and her response was wack. While we were sitting around eating with some friends, Sly revealed that some chic once said that he looked like the Black Stifler (American Pie) . I swear that I couldn't stop laughing for like 15 minutes and I didn't even have a drink. All I had was a ginger ale. You gotta see the comparison though. 7:05pm - 7:56pm - We walked back to the hotel as the heat simmered down a bit. Showered up and changed into game time attire. 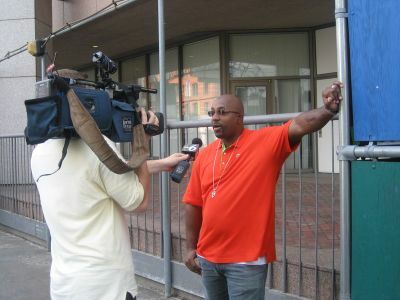 Sly decided to videotape us on his digital camera trash talkin' this go round. Some folks are gluttons for punishment I suppose. He kept referring to Cleon from Dead Presidents and saying that the Lakers beating the Celtics was like that head being buried in the movie. You gotta know Dead Presidents to understand it... lol. 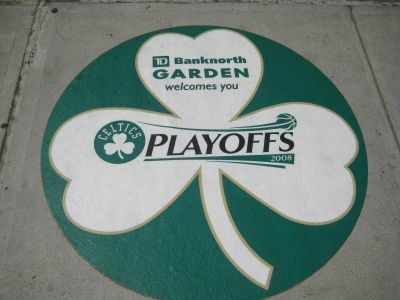 From that nonsense we walked over to TD Banknorth Garden and stood in a crowd of folks for about 5 minutes. I got wise and circumvented the massed and walked right to the side near the front and made myself fit it. The fellas followed. We shaved off about 10 minutes of waiting with that move. 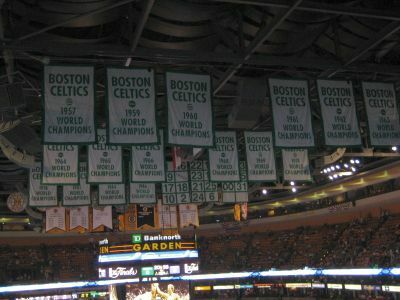 7:58pm - Look at those championship banners. 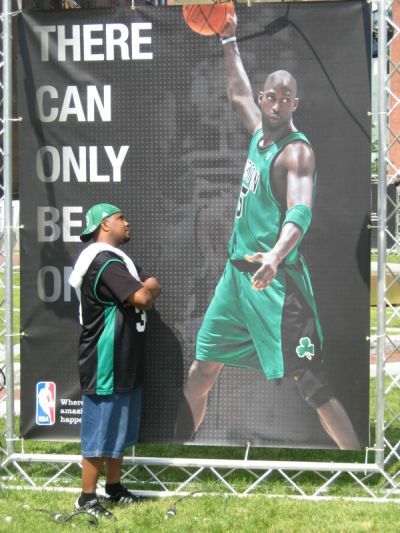 All that history and Celtic Pride. 7:59pm - 8:45pm - Me and the fellas walked around the facility soaking in the moment. We walked around, gave high fives to other fans in our respective colors and pointed out celebs that we saw. Went to our seats and chopped it up with the folks in our section. Of course I was berated for bringing along two knuckleheads. 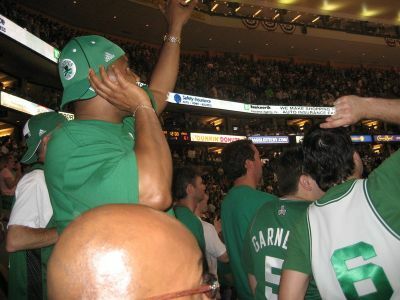 I assured the hometown people there that when the Celtics reign of terror began that those two cats would get silent. 9:02pm - 9:07pm - National Anthem, Player Intros and Tipoff. 9:09pm - Game begins. The arena is crazy loud. 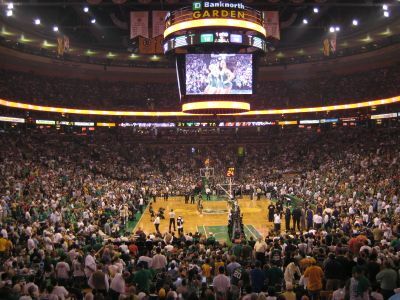 Celtics fans are pumped up. 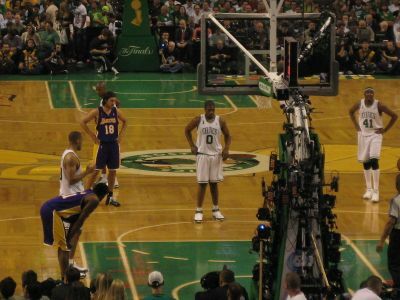 9:21pm - After taunting Laker fans about Gasol being weak and calling him Ga-Soft loudly, Pau does a baseline move and dunks on Garnett ferociously. 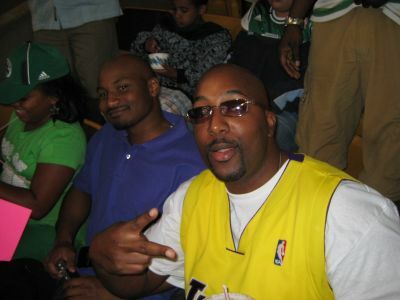 Every Laker fan within earshot gives me the business. 9:38pm. Both squads come out ballin'. Lakers lead after the 1st quarter 22-20. 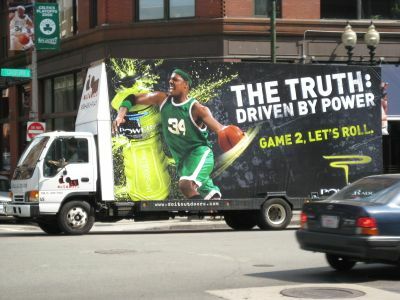 9:59pm - Paul Pierce for Threeeeeeeeeeeeeeeeeee!!!! 10:18pm. 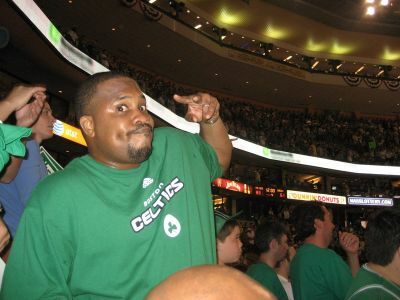 When Rajon Rondo had that block and one handed dunk I was in stands doing the Rodeo dance and they caught me on the Jumbotron in the arena wildin' out. 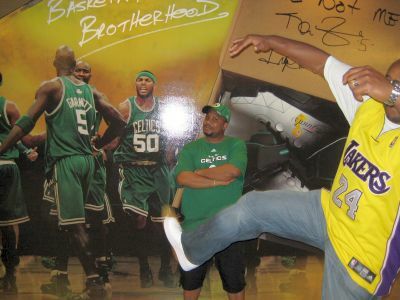 I was hee hawin on all dem Laker fans! Which reminds me, I need to see if the arena videotapes all the game stuff with the fans. I need that classic moment of myself. Then again, if you saw me dance you might have a heart attack. Nevermind, if I do get it I won't post it.... lol. 10:23pm - Halftime. 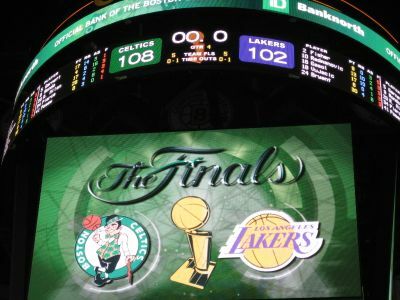 Celtics 54 - Lakers 42. 10:36pm - Came back to my seat after getting my Coke from the concession. The kid next to me flashed his camera phone and there's a picture of him and Magic Johnson. I asked him where he got it and his dad told me the story of how Magic came through our section 3 minutes after I left my seat and how everyone was shaking hands and taking pics with him. Yep... I was mad. 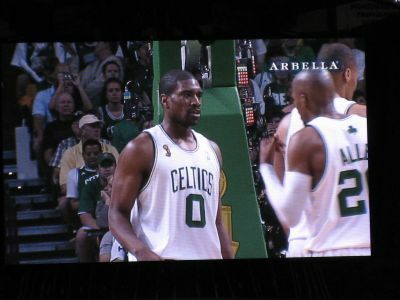 10:49pm - After a Leon Powe dunk + 'and one' I started doing more of my dances. Those included the Cabbage Patch, the Running Man and the 'Raj' from What's Happening. I was really feeling it cuz my squad was doing work on the court. I was advised that I was on the Jumbotron again. I didn't see myself that time. 11:25pm - End of 3rd quarter. 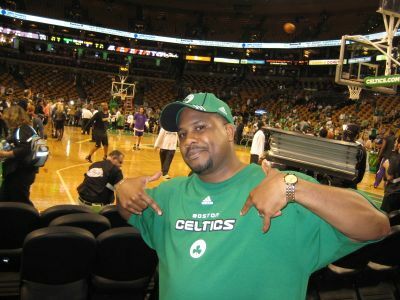 Celtics are killin' em 83-61. 11:26pm - 11:48pm - I can't tell you what happened. One minute I'm celebrating, the next I was on the edge of my seat. All I know was that my victory speech was already prepared. 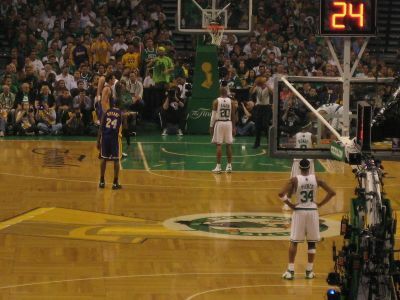 I witnessed the Lakers make a crazy comeback and almost take the lead. 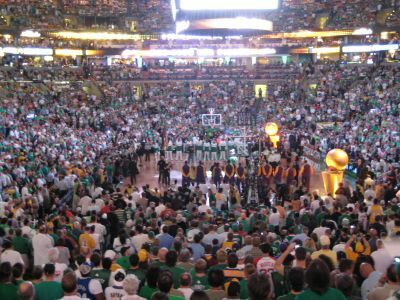 I was not ready to have to live with the fact that I was witness to seeing one of the greatest comebacks in NBA Finals history and my team was on the short end. I think my heart was about to come through my chest. It was that intense up in there. 11:51pm - 12:12am - Hung around the arena. 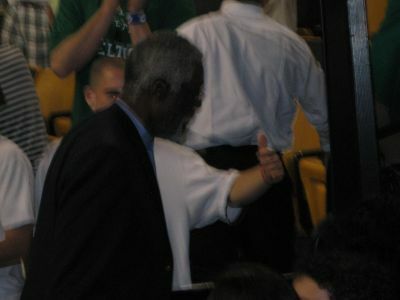 Gave a few high fives to other Celtics fans, but was just happy for the win. Took some more pics with the fellas. Saw a rack more celebs and athletes hanging around as well. 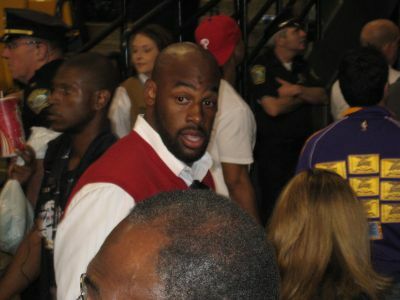 Those included Donovan McNabb, Bryan Westbrook and Brian Dawkins of the Philadelphia Eagles, a rack of current and former Patriots and Red Sox players, Bill Russell, Kareem Abdul-Jabbar, Magic Johnson, Rick Fox, Allan Houston, Jeff Green, Al Jefferson and a whole bunch of others I can't recall right now. 12:26am-1:43am - Kicked it with the fellas in the streets for a while. Talked more trash since my squad won. They were encouraged by the comeback, but the disappointment was obvious regardless of what they said. 1:44am - 3:17am - Sat up in the room and rapped to Juice for a while since it had been over year since we had seen each other. 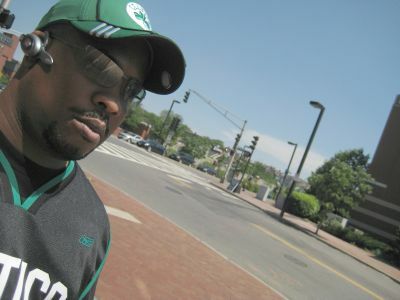 I see Sly in DC, so it aint no thing. That cat was dead tired and knocked out in like 5 minutes. All that complaining about the refs probably made his soul weak. 3:18am - 4:15am - Left the hotel and did the drive back to Providence airport. 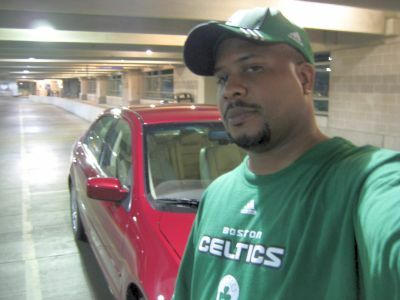 I took it easy and relaxed as I tried to find a decent R&B/Hip-Hop station on the radio. 4:16am - Stopped at the Exxon next to the airport and gassed the rental car. Maaaaaaaaaaaan... gas is high as hell. Cost me like $25 for like a 1/4 tank. Picked up a glazed donut from the Dunkin' Donuts kiosk inside and killed that joint. I was hungry. 4:27am - Returned rental car to Budget. There was an agent there, but she gave me some nonsense about leaving for the night, told me to do the drop box and peeled off. So I had to do the whole fill out the envelope thing which I hated doing and I didn't even have a pen. Eventually I found one laying on the ground. Fools didn't even have a pen on their counter. 4:34am - 6:25am - Two hours before my scheduled flight. Got through security with ease since there was hardly anyone in the airport. Went to the gate and watched ESPN for about 30 minutes since I hadn't seen any highlights of the game. After that I attempted to catch a few zzz's. 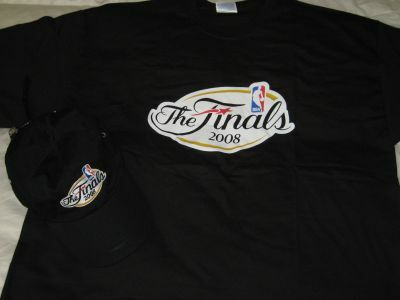 Within 10 minutes I was awakened by some clown who saw my NBA Finals bag and started talking my ear off. He was joined by about 4 more 'friends' who made me wanna duct tape my eyes and ears. 6:43am - 7: 36am - Flight got up in the air. I curled up and went to sleep for about 3o minutes. Then the older man who was from Hawaii next to me asked me about the game... and this fool didn't even know who was playing or anything about basketball. He was just making conversation. Why me maaaaaaaaaan... why me??? he totally looks like a black Stiflier...totally...HA! 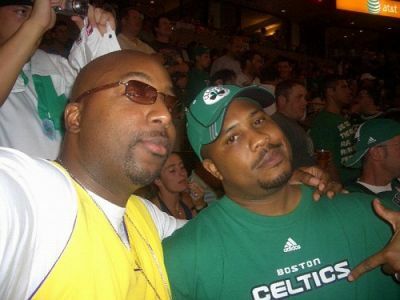 looked you guys had a GREAT time...and truly do believe that the Celtics will take the series....i won't tell him i think that though..HA! Damn.. 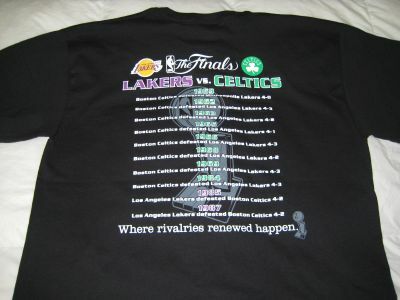 I aint even a Celtics fan... even though I was going for them the whole time and even predicted they would win it all in 6... after this post you made me wish I was... great stuff! C'mon bruh... you can't be serious!!? ?